The golden hue. That first crisp refreshing sip that promises warmer days. Wheat beers often usher in the summer months with their hints of citrus and unique wheat palate. While for many the first wheat beer of the season is the unofficial start of summer, in Michigan, home of Bell’s Brewery Inc., the release of Oberon Ale is practically a state holiday. “We host Oberon midnight release parties around the state and pack bars at Midnight to pour the first pint of Oberon. 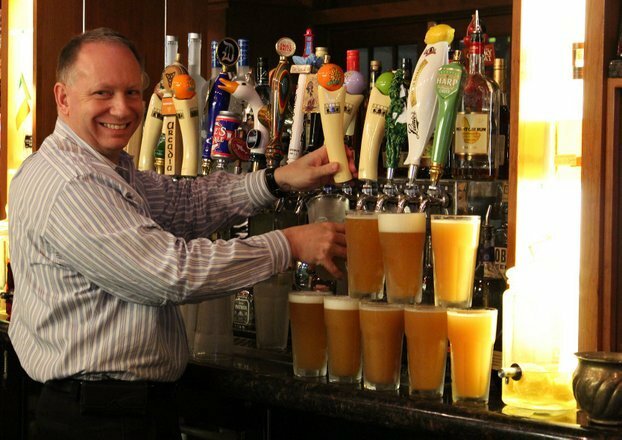 It’s a lot of fun; that’s what our customers have asked for,” explained Laura Bell, Bell’s vice president, who sat down with Craft Brewing Business to talk about the rise of Oberon for our Beer of the Month salute to wheat beers. “Quality first — no matter what kind or style of beer you’re making. With so many new breweries right now, the people that are making quality beer are going to be the ones that are going to come to the top.” — Laura Bell, Bell’s Brewery vice presidentFirst a little background: Larry Bell founded Bell’s Brewery in Kalamazoo, Mich., in 1985, brewing beer in a 15-gallon soup kettle. Well before the rise of craft beer popularity that Bell’s enjoys today, a focus on quality craft beer help grow Bell’s from a small 135-barrel (bbl) startup to a regional craft brewery with a capacity of more than 500,000 bbls. Oberon was first brewed in 1992. Back then it was called Sol Sun, until 1997 when the Mexican brewery that makes Sol asked Bell’s to change the name. While many breweries today are running into trademark issues with their beer names, which leads to marketing campaigns to spread the word on the changing brand, Bell’s was fortunate to make the change before craft beer was on the average beer drinker’s radar. At the time, Bell’s was more concerned with growing its small brewery. Bell was quick to point out that as the craft industry has grown, it’s more important to have a mind for marketing. That’s why Bell’s created a marketing department around five years ago. But in ’97, Bell’s was able to simply change the beer’s name to Oberon and never looked back. Oberon season basically runs through baseball season — from spring’s Opening Day to the fall’s World Series. Bell’s sells more Oberon during Oberon season than any other year-round beer. With successful Oberon parties like this, it’s no wonder why. “Around the time it became Oberon, people started to become more excited and interested in craft beer as the ‘90s were ending and into the 2000s,” Bell said. “Thanks to Bell’s drinkers and craft enthusiasm, it turned Oberon into this phenomenon for us … Oberon is definitely the flagship, not only for the wheat beer category at Bell’s, but also for Bell’s in general. We sell more Oberon during Oberon season than we do any other year-round beer. That’s being closely challenged by Two-Hearted [IPA], but it’s still the most popular beer we sell. According to Bell, she believes that the beer’s popularity is driven by its American wheat roots and its approachability. As interest in craft beer grows, Bell explained that she’s heard a common refrain from life-long Bud Light drinkers who opened up to Oberon and now enjoy all different styles of craft beer. In many ways, an approachable wheat beer is a gateway beer to the wonderful world of craft, and that helps all styles grow in popularity. Oberon isn’t the only wheat that Bell’s brews. The brewery also brews and bottles Winter White Ale — its winter seasonal that is Bell’s play on a Belgian white (but not specifically, Bell noted). Bell’s also has a small brewing facility in downtown Kalamazoo that has been known to craft small batch specialty wheats. The most notable is Wedding Ale — a wheat with coriander, grains of paradise and orange peel, and it’s a bit more “high octane” at 8 percent alcohol by volume (ABV). That is typically only available on specialty draft and on occasion in 750-ml bottles at Bell’s General Store. Bell’s is putting more emphasis in differentiating its wheat offerings to educate customers. For starters, having different seasons for the wheats — Oberon in the summer and Winter White in the winter. The beer’s labeling also plays an important role. Bell’s Oberon is a beer fit for a king — so the brewery crowns one. If recent news is any indication, Bell’s fandom transcends “cult” status. Bell’s announced that it plans to expand into Michigan’s Upper Peninsula after purchasing a 3.16-acre lot, which will be the future home of Upper Hand Brewery, a division of Bell’s Brewery Inc., where a variety of beers will be brewed and bottled for distribution across Michigan’s Upper Peninsula, as well as adjacent northern states.